Adapted from "Mastering Bitcoin: Programming the Open Blockchain" by Andreas Antonopoulos. With so many alt-coins currently in the cryptocurrency world, how can one reliably evaluate and decided which coins are worth deeper understanding and analysis? Which cryptocurrencies come with real-word applications and which are just a marketing ploy for a get-rich-quick scheme? Is the alt-coin introducing a significant innovation? Does the alt-coin differentiate sufficiently from Bitcoin? Is the difference compelling enough to attract users away from Bitcoin? Does the alt-coin address an interesting niche market or application? Can the alt-coin attract enough miners to be secured against consensus attacks? 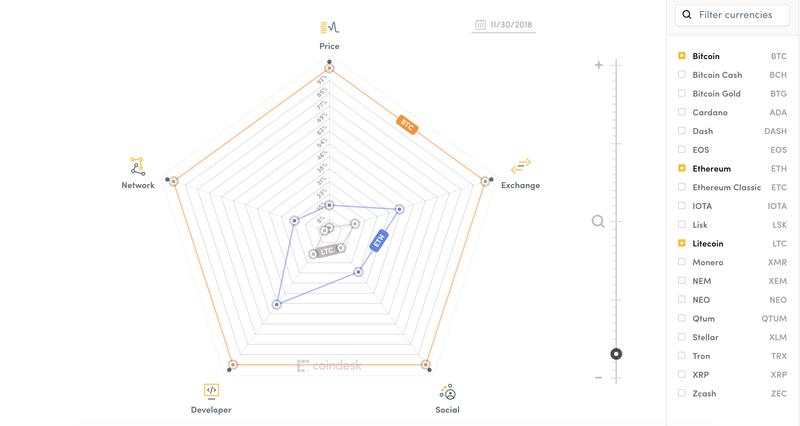 Recently, CoinDesk released the CoinDesk Crypto-Economics Explorer, which a visual tool designed to measure and track interest and activity in crypto assets. The analysis measures five different segments of the cryptocurrency: Price, Exchange, Network, Social, and Developer. Each of these contain individual factors that are used to calculate a total score for each category. Taken together, these factors enable a user to compare the crypto-economics of an asset against another. The scores of each segments for the cryptocurrency is pegged to Bitcoin's index. More details can be found here. 1. What is the total market capitalization of alt-coin? 2. How many estimated users/wallets does the alt-coin have? 3. How many merchants accept the alt-coin? 4. How many transactions (volume) are executed on the alt-coin? 5. How much value is transacted daily? Some of these details about cryptocurrencies can be found at CoinMarketCap. How to detect triangular arbitrage opportunities on coinut.com? Sometimes, the market can be inefficient and there can be a situation that if we convert BTC into LTC, and then to USDT, and finally back to BTC, we can get more BTC than what we have originally, i.e. triangular arbitrage.